Pormpuraaw (Porrm-puur-ow) was previously known as Edward River Mission and is situated on the west coast of Cape York Peninsula between the Chapman River and Mungkan Creek. The community is home to 2 groups of people, the Thaayorre (Thie-Orr) people and the Mungkan people, and includes 16 outstations. European settlement on Cape York began with the establishment of Somerset in 1865. The settlement was formed at the tip of Cape York after a recommendation from the Governor Sir George Bowen that it would be a favourable location for a harbour of refuge and a well-positioned international trading port. After this fatal encounter, the Jardine brothers continued north, crossing the Coleman and Edward rivers and on to Somerset. Gold mining brought further European settlement to Cape York, after William Hann’s expedition found gold on the Palmer River in 1872. In 1876, Robert Sefton found gold while prospecting at the Coen River. His return to Cooktown with 140 ounces in 1878 prompted a subsequent gold rush in Coen. The town of Normanton was established by 1868, and a Native Police detachment was stationed there shortly afterwards. Native Police camps were established at Highbury in 1885 and in Coen in 1888, which helped European settlement advance further into Cape York. In 1874, the Mitchell River was considered as a potential location for a port to service the Palmer River goldfield. The river was surveyed again in 1886, with a view to establishing a town to service the recently formed pastoral stations. However, neither of these surveys reportedly amounted to anything. In 1896, it was argued that, as the land from Albatross Bay down to the Gilbert River was not needed for European settlement, there was no need to establish a mission in the area. In 1900, the Church of England created the Diocese of Carpentaria, based on Thursday Island. Securing a grant from the Queensland Government, Gilbert White (the first Bishop of the Diocese of Carpentaria), turned to Ernest Gribble for help in establishing a mission at Mitchell River. Gribble had considerable experience running the Yarrabah Mission near Cairns. The land was gazetted as an Aboriginal reserve on 10 January 1903. In 1905, Gribble, Bishop White and their staff established a permanent mission at Mitchell River. In 1923, the Mitchell River Mission superintendent, Joseph Chapman, began to visit the large, semi-permanent Aboriginal camp at the mouth of the Edward River. ‘[O]n the Edward River 50 miles north of the Mitchell River station, there are about 150 [A]boriginals, who have had little association with whites. They live close to the sea, and behind them is a stretch of desert country, so that their habitation is more or less permanent. They have shown a decided tendency in the direction of agriculture, and any seeds given them have been cared for and planted. A Mission station has been started for the care and instruction of these people’. Chapman continued to visit the site during the 1920s, but the establishment of a permanent mission station was stalled because the Diocese of Carpentaria was unable to find the necessary funds. Chapman was keen to extend the missionary influence to the Edward River, to block attempts to have the area thrown open to pastoral selection. Anglican missionary, Walter Daniels, attempted to establish a mission station at Coleman River during 1932, but this attempt also failed. In 1939, Joseph Chapman returned to the Edward River to establish a permanent mission station. By the late 1940s, the mission had a population of 301. The mission was largely self-sufficient with palm leaf houses and a farm that grew bananas, palms, sweet potatoes, yams, sugar cane and kitchen vegetables. The Aboriginal residents built fish traps and canoes that were used to supply the mission with fish. In 1950, cattle were introduced for meat, after 20 square miles of the reserve was fenced. Under the Aboriginal Protection and Restriction of the Sale of Opium Act 1897, which granted the Home Secretary the power ‘to cause Aboriginals within any district to be removed to and kept within the limits of any reserve situated in the same or any other district’, there were 11 recorded removals from Edward River Mission to Palm Island. In the early days of the mission, the children were sent to Mitchell River Mission School. In 1950, a school was constructed at the Edward River Mission, and Reverend Brown commenced service as the teacher. By 1953, 32 students were enrolled, mostly young children. The older Edward River children continued to go to Mitchell River Mission and, into the 1960s, were still being housed in the Mitchell River dormitories for the purpose of schooling. In January 1952, the mission was hit by a cyclone and every building except the superintendent’s house was either blown down or badly damaged. It took several years for the mission to be completely rebuilt. In 1956, a cattle manager was appointed to establish a herd of mixed breeding cattle. Cattle produced were used for domestic consumption and the surplus sent to Mitchell River to be sold with their cattle. By 1964, cattle-raising was the main industry of the mission, which was run by Aboriginal stockmen supervised by head stockman, Jim Kendall. Mission superintendent, Joseph Chapman, returned to Mitchell River Mission in 1957 and was replaced by Reverend Pidsley, who was subsequently replaced by Gordon Green in 1958. In 1958, the southern part of the Aurukun reserve was added to the Edward River reserve, after an agreement was reached between the Presbyterian Church (which ran the Aurukun Mission) and the Anglican Church (which ran the Edward River Mission). This effectively doubled the size of the Edward River Reserve from 554,880 acres to 1,152,000 acres. In 1966, the Anglican Church approached the government to take control of the mission. Responsibility for the mission was handed over to the Queensland Government on 1 May 1967. In 1971, a pilot crocodile breeding research project was established in the area. In 1972, a crocodile farm was established with Australian Government funding by Applied Ecology Pty Ltd. By 1975, the farm contained 1,012 crocodiles. On 30 March 1985, the Edward River community elected 5 councillors to constitute an autonomous Edward River Aboriginal Council established under the Community Services (Aborigines) Act 1984. The Act conferred local government type powers and responsibilities upon Aboriginal councils for the first time. On 23 July 1987 the council area, previously an Aboriginal reserve held by the Queensland Government, was transferred to the trusteeship of the council under a Deed of Grant in Trust (DOGIT). Also in 1987, the Edward River Mission community changed its name to Pormpuraaw, taken from a local dreamtime story in the Kuuk Thaayorre language of the Thaayorre people, about a burnt hut or ‘Pormpur’. On 1 January 2005, under the Local Government (Community Government Areas) Act 2004, Pormpuraaw Aboriginal Council became the Pormpuraaw Aboriginal Shire Council. It is widely accepted in the community of Pormpuraaw that the Thaayorre and Mungkan Peoples are the Traditional Owners however a determination of native title by the courts has never been made. Pormpuraaw Aboriginal Shire Council, Community Plan 2011-2021 (2011) at 6 March 2013. C G Austin, ‘Early History of Somerset and Thursday Island’ (1949) Journal of the Royal Historical Society of Queensland, 4, 2 <http://espace.library.uq.edu.au/eserv/UQ:212282/s18378366_1949_4_2_216.pdf> at 8 April 2013. F J Byerley (ed), Narrative of the Overland Expedition of the Messrs. Jardine, from Rockhampton to Cape York, Northern Queensland (Buxton, Brisbane; 8967). An electronic version of the narrative can be found at: <http://ebooks.adelaide.edu.au/j/jardine/frank/j3n/> at 20 November 2012. G Pike, The Last Frontier (1983) 63-64; Author unknown, ‘The Coen’, The Queenslander, 13 July 1878, 470. P Saenger, Sweers Island: Changes over 200 years since Flinders visit, Gulf of Carpentaria Scientific Report (Southern Cross University: 2005) 15. J Richards, The Secret War: A True History of Queensland’s Native Police (University of Queensland Press, St Lucia, 2008). Author unknown, ‘Exploration of the Mitchell River’, Brisbane Courier, 29 January 1874, 4; Author unknown, ‘The Mitchell River’, Brisbane Courier, 11 March 1886, 3. Author unknown, ‘Aboriginals of Queensland’, Brisbane Courier, 21 October 1896, 6-7. N Loos, White Christ, Black Cross: the emergence of a black church (Aboriginal Studies Press, Canberra, 2007) 58. P Freier, Living With the Munpitch: The history of Mitchell River Mission, 1905-196 (PhD Thesis, James Cook University, 1999) 101, 110. Freier, above n 15, 126. Freier, above n 15, 146-149. Freier, above n 15, 185-194, 202. Author unknown, ‘New Mission Station’, The Queenslander, 1 March 1924, 15. Author unknown, ‘Church News’, Brisbane Courier, 23 February 1929, 7. Freier, above n 15, 202. Queensland, Native Affairs – Information contained in Report of Director of Native Affairs for the Twelve Months ended 30th June, 1946 (1946) 1. Queensland, Native Affairs – Information contained in Report of Director of Native Affairs for the Twelve Months ended 30th June, 1949 (1949) 30. Queensland, Native Affairs – Information contained in Report of Director of Native Affairs for the Twelve Months ended 30th June, 1947 (1947) 24. Queensland, Native Affairs – Information contained in Report of Director of Native Affairs for the Twelve Months ended 30th June, 1950 (1950) 52. Christopher Anderson, ‘Queensland Aboriginal Peoples Today’ in J.H. Holmes (ed.) Queensland: A Geographical Interpretation (1986) 296-320. Queensland, Native Affairs – Information contained in Report of Director of Native Affairs for the Twelve Months ended 30th June, 1953 (1953) 47. SRS505/1/7557, 18A/20, Admin, Edward River, Transfer to State, Cabinet decision dated 17 May 1966. Queensland, Native Affairs – Information contained in Report of Director of Native Affairs for the Twelve Months ended 30th June, 1952 (1952) 42; Queensland, Native Affairs – Information contained in Report of Director of Native Affairs for the Twelve Months ended 30th June, 1954 (1954) 45. Queensland, Native Affairs – Information contained in Report of Director of Native Affairs for the Twelve Months ended 30th June, 1956 (1965) 58. Queensland, Native Affairs – Information contained in Report of Director of Native Affairs for the Twelve Months ended 30th June, 1958 (1958) 55; Queensland, Native Affairs – Information contained in Report of Director of Native Affairs for the Twelve Months ended 30th June, 1960 (1960) 45. Queensland, Native Affairs – Information contained in Report of Director of Native Affairs for the Twelve Months ended 30th June, 1964 (1964) 20. Queensland, Native Affairs – Information contained in Report of Director of Native Affairs for the Twelve Months ended 30th June, 1957 (1957) 47; Above n 33, 54. 18A/20, Edward River Transfer to State. 01-029-004, Edward River Crocodile Faming. 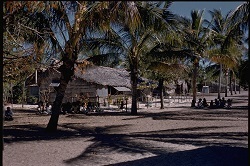 The Edward River Mission village circa 1950-60.